The hills of Tuscany are filled with terraced vineyards, old stones homes topped with terra cotta roof tiles and some of the most beautiful gardens in the world. The style is simple and casual, as it is rooted in the agrarian history of the area. It is entirely worth emulating in your own backyard and is easy to pull off by following a few basic guidelines. 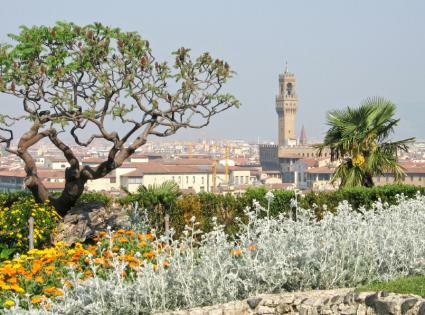 Plants from the Mediterranean region contribute effortlessly to the Tuscan style. Of course, nothing says Tuscany more than a gnarled old grapevine. Beyond the flora endemic to the region, most plants that are from other areas with hot, dry summers and cool winters are good candidates. These represent the opposite end of the spectrum from tropical-looking plants. Their leaves tend to be small and often have a grayish cast - two traits that help them conserve moisture in their arid environs. A few examples are bougainvillea, euphorbia, the many varieties of salvia and a few edibles, like artichokes, thyme and oregano. Succulents are always a good bet for a Tuscan-themed landscape, as are the many varieties of agave and New Zealand flax. Muted grey-greens and warm pastel earth tones are common themes of a Tuscan landscape, as are the cool blues of lavender and rosemary flowers. However, these cannot be without a few bold accents of pink, red and orange. 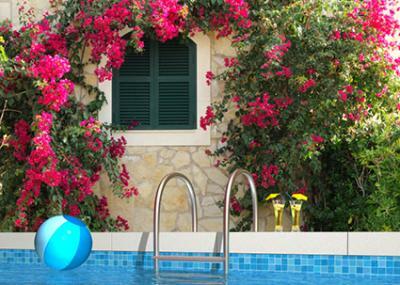 Red salvias, orange daylilies and hot pink oleander are good choices for this purpose. 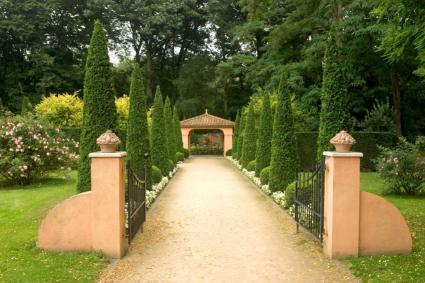 Hardscaped areas are an important part of creating a Tuscan-style landscape. Natural stone is an inseparable part of a Tuscan garden. Go with warm brown, red-tinged or salmon-colored varieties, avoiding darker cool-toned types, such as slate. Flagstone laid in a bed of crushed granite fines with these color values makes great patios and paths. Mexican floor tiles also have the perfect color scheme for paving a patio or courtyard in a Tuscan-themed landscape. 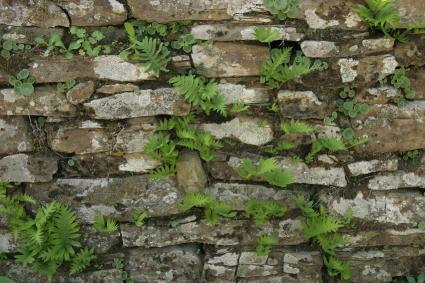 Stone walls, whether for terraces or just to divide separate garden areas, fit the bill. These can be dry-stacked (built without mortar) if they will be less than three feet tall. Set lichen-covered fieldstones of varying sizes randomly among the plants to give the effect of a rocky Tuscan hillside. Make sure to bury one- to two-thirds of each mini-boulder, so it looks like it was there naturally. Choose the best looking face to orient in the direction where it will be viewed most often. Wooden pergolas and arbors are also suitable, especially if they are covered with a grapevine or wisteria. Accessorize the landscape with features reminiscent of Tuscany. Stone fire pits or fired clay chimeneas, or outdoor fireplaces, are a natural fit with all the stonework that is typically part of a Mediterranean landscape. These can range from simple pre-fabricated models that can be set onto any existing patio, to custom-built outdoor kitchens with a wood-fired pizza oven. 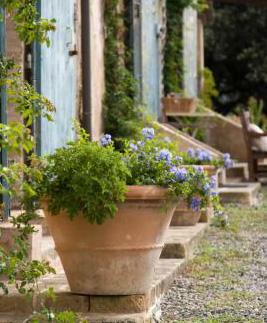 Fired clay planters - or just empty urns - are one of the quintessential elements of the Tuscan landscape. These are integral parts of the patio space that is must to accommodate the outdoor lifestyle inherent in this part of the world. Water features are typically in the form of a fountain, rather than pond basins set in the ground and landscaped to look like natural features. The classic approach is a wall-mounted fountain on the interior of a courtyard area that spills into a rectangular aboveground basin made with decorative stone and/or concrete. The culture of Italy - and the natural elements found within it - are what defines the Tuscan landscape. It's about long meals with freshly prepared ingredients from the garden, the pungent smell of herbs, and the timeless feeling of a landscape where everything seems to be in its place.